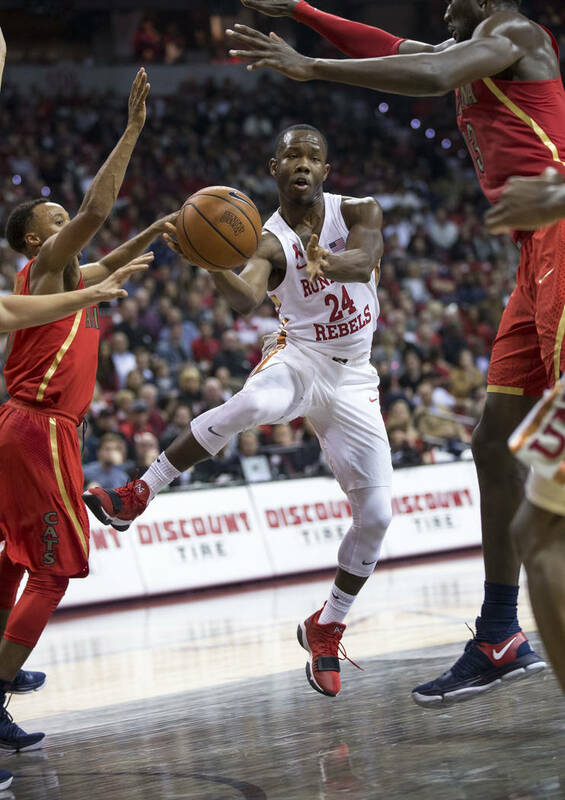 The Rebels and Arizona certainly didn’t disappoint Saturday night in delivering the type of tenor most hoped for, an overtime thriller won by the Wildcats 91-88 before 14,579. It was, as much as anything else, about atmosphere. About a building rocking and swaying and shaking like it hasn’t in some time. About a student section actually filling its allotted seats. About a town recapturing its interest in a basketball program that has long defined the sports pulse of this community, only to have much of the shine stripped from its brand with a forgettable coaching search and losing results over the past year. It was, as much as anything else, a way to reintroduce UNLV back to a fan base that had largely stayed away lately. And it did. It more than lived up to the hype. And as with any final, the box score will tell you countless things each team could have done better. 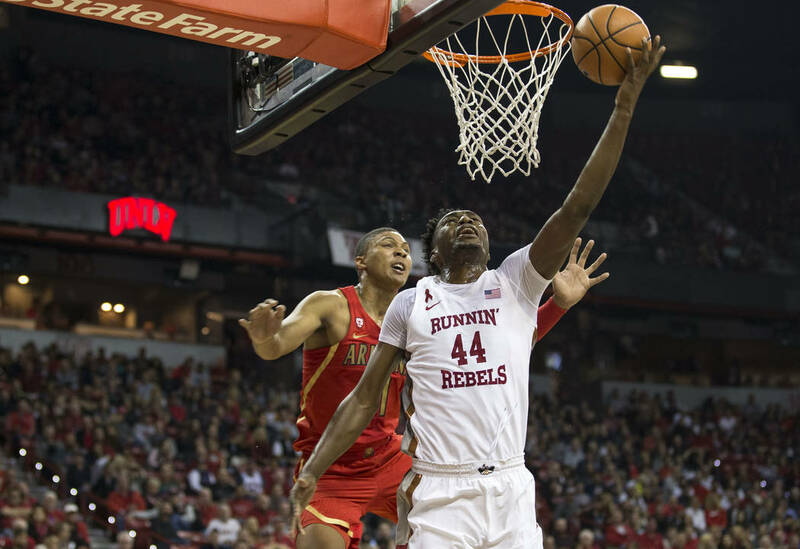 UNLV will look back and probably critique key moments at the end of regulation and overtime — where shots came from, who took them, why it absolutely refuses to double the post, why it kept running the same dribble weave play every possession down the stretch — but this sort of effort also will play well against the Mountain West’s best sides. UNLV lost to a better team, but perhaps gained some followers in the process. There is a reason 25 scouts from 21 NBA teams made their way to the Thomas & Mack Center, a way to evaluate two of the country’s top freshmen and names most mock drafts have firmly placed within the 2018 lottery. Brandon McCoy of UNLV and Deandre Ayton of Arizona won’t be in college long, so matches like this are special in that each contributed at an expected level. McCoy in 37 minutes finished with 33 points and 10 rebounds, his line including six turnovers that again proved the point his decision-making needs improving when a double team arrives, something he can absolutely count on in league play from opponents such as UNR and San Diego State. Ayton was just as impressive, totaling 28 points and 10 rebounds in 39 minutes. You can’t overstate how much UNLV can build on such a game, the memories of last year’s 11-win disaster still fresh in so many minds. Beating down Utah at T-Mobile Arena is one thing, but taking Arizona to overtime — even a Wildcats side that has uncharacteristically struggled to begin the season and is still without one of its best players in guard Rawle Alkins — can go a long way in a team’s growth. 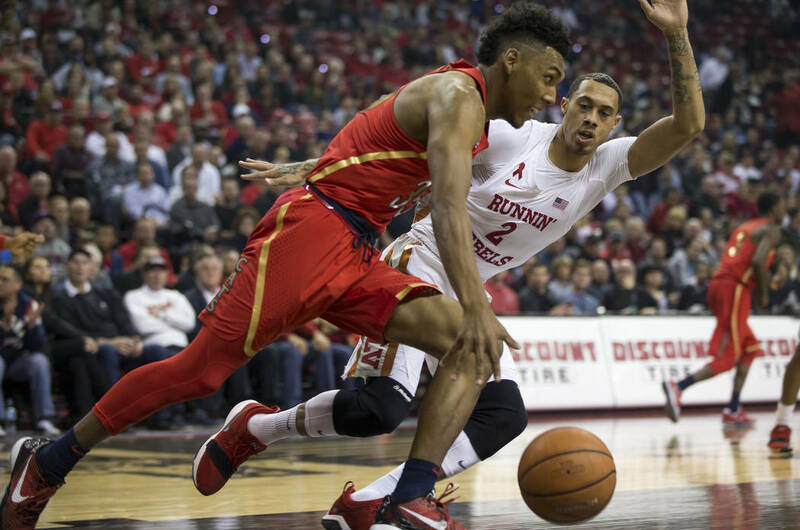 The opening 20 minutes couldn’t have gone better for UNLV, which led 41-30 at halftime because it was the better, more aggressive side. Whichever assistant coach had the scout for UNLV obviously understood how best to take advantage, which is to say attack the rim at one end against the Wildcats and be fine with them trying to stay in things beyond the 3-point arc at the other. Arizona was 1 of 11 on 3s in the half. Ayton was the best player on the floor during the half, but Arizona is in a place where after him and junior guard Allonzo Trier, consistent efforts have been difficult to find elsewhere. Example: In the half, Ayton-Trier combined to shoot 10 of 19. Everyone else was 4 of 21. 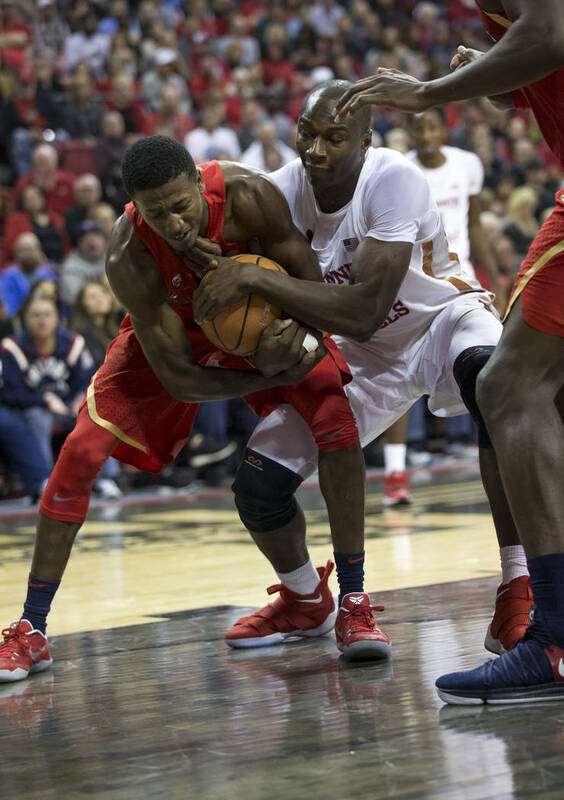 Trier scored 29 in 43 minutes, and the Wildcats rallied by breaking UNLV down time and again midway through the second half. 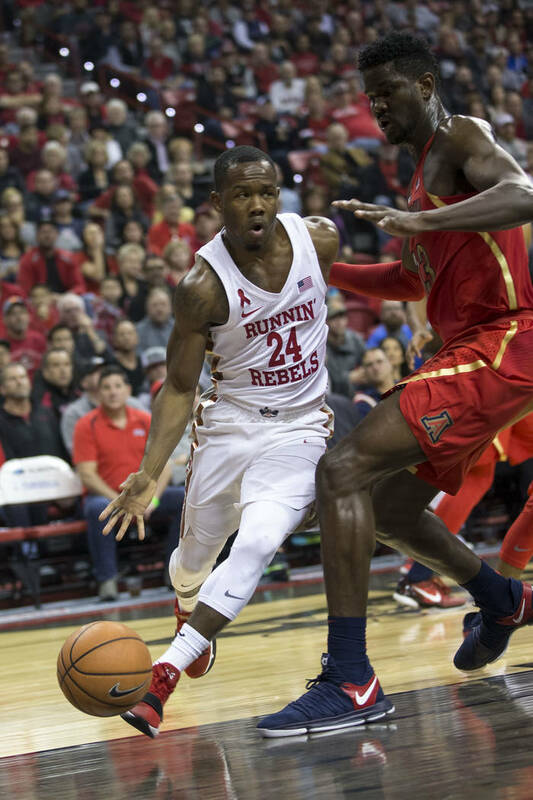 While most of the pregame hype was rightly about Ayton and McCoy, UNLV isn’t in this game with a chance to win without the effort of junior Shakur Juiston, who went for 21 points and nine rebounds in 37 minutes before fouling out in overtime. What it means: On an early December night in the second season of coach Marvin Menzies’ tenure, the Thomas & Mack Center rocked like old times. Students showed up. NBA scouts were there in droves. The place was electric. Even one of the more popular names of the Golden Knights, James Neal, cheered loudly at courtside. One such nonconference game remains when UNLV faces Illinois on Saturday night at the MGM Grand Garden, one more opportunity to meet a Power Five Conference opponent and, depending on the result, perhaps build some goodwill within a NCAA Selection Committee room when it comes for at-large berths to be discussed. That’s a long way from now, but never underestimate how far specific nonleague results can go when countless resumes are compared. A win on Saturday would have been huge for such things, but don’t discount the atmosphere it created. For one night, things were rocking and swaying and shaking yet again.